Tutorial originally posted on The Ribbon Retreat blog. So a few months ago, I saw a baby blanket that was a herringbone pattern and fell in love. I saw it on my friend Erika’s blog and I knew that I wanted it for my master bed, and was determined to teach myself how to make it. You ready to learn along with me? I started with 3 yards of Etching Slate fabric and 3 yards of Porcelain fabric. I then cute each into long 7 inch strips. From there, I cut it into 7 inch squares. Once my squares were all cut, I then cut them again at a diagonal right down the center. Then it was time to piece them all together. I got my hubby in on the action to help with this part. Taking one white, and one grey piece, I sewed with a 1/4” seam down the diagonal of the triangle using a straight stitch, and back stitching at the beginning and end of each triangle. Now, if you are making this with a patterned material, or one that has a “right side” and a “wrong side” you will want to put all right sides together before sewing. That way the seam is on the inside of the project. Once ALL the triangles are pieced together, you will end up with a grey on one side, and a white on the other. Open the triangle up and with the right side down, iron flat the seam. Now you get to make your pattern. I did 13 squares per row for a queen size cover. You will lay out all of your squares to make your pattern as shown above. Make sure that every other row you rotate from an inclining pattern to a declining pattern. Once you have it all laid out, you will sew it together one square at a time. leaving the two ends that touch together, place right sides together and sew with a 1/4 inch seam and straight stitch (make sure to back stitch at the beginning and ending of each square). Continue this step until ALL your squares have been put into rows. Laying each row out on the floor to make sure you are continuing your pattern. When you are done, you should have a pattern that looks like above. You will then use the same technique as above, to piece together each row. Lay two continuous rows on top of one another, with right sides touching and sew the side that was touching when laid out. DO NOT SEW THE WRONG SIDES TOGETHER. This will mess up your pattern (speaking from experience!) I found the best way to do this was 2 single rows, then the next 2 single rows, then sew those two together. and so on. It was easier than 5,7,9 etc. rows at a time at the sewing machine! Once you have ALL your row together (mine was 13 squares by 13 squares when I was done) iron all of your seams flat. This will help it to lay flat on your bed. Now its time to put the back of the cover on. I purchased a queen size sheet for my backing. You can get them fairly inexpensive, but if you’d like you can also just use fabric pieced together to be big enough. You’ll need about 90×100 for this. 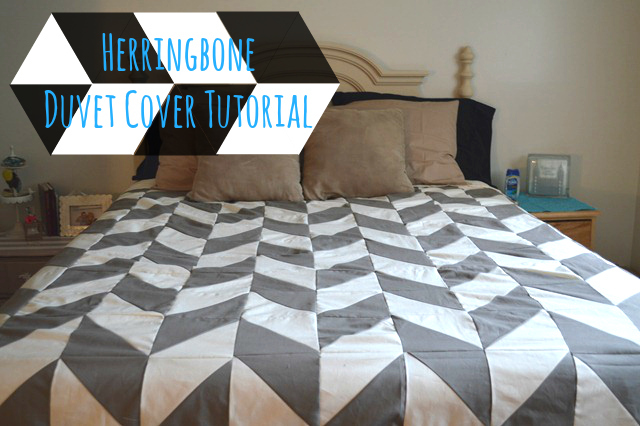 With the right side of the herringbone blanket facing UP, lay the sheet on top of it with the right side facing down. Then pin each side together with a 9 inch overhang at the bottom. Now, the sheet is wider than the herringbone pattern so you are going to have a a bunch of excess in the middle you want this! Then sew up the sides with 1/4 seam. Then fold up the bottom to cover about 1/4 inch of the herringbone pattern. You will be sewing on top of the fabric since the sheet is already finished at the bottom and will leave a clean edge. (ignore that I took the above picture before flipping it right side out. Oops!) Then sew the bottom up with about a 1/8 inch seam from the finished edge of the sheet. So not the bottom, but about 1/8 in from the pattern. You will also do a wrapping paper fold on the top and fold it to overlay the top of the herringbone pattern about 1 inch. Then sew around both side with a 1/8 inch seam to keep the crisp fold on your border and to hold down your top fold. You are now just about done. All you need to do is attach either some snaps or Velcro to keep the top fold in place. I used some sew on Velcro that I had on hand. Now not only do you have a cute cover, but it looks like your bed is neatly made when you put it on because your sheet is folded all pretty over the top! I am still in love with this!!! It’s looks so great, you did such a good job on it! Thanks! And thank you for being my “in the process of” picture gal. You helped keep me going when I got tired of sewing! Love love love this! You are too talented, lady! Oh, thanks so much hun. Seriously, I died over Hazel’s blanket and had to have one of my own. It’s not quite as cute, but I tried!! That’s cute. I wish I had the time and patience to make one myself. Thanks. It definitely took some time. Mainly cutting the squares. You know me, I’d prefer quick and done! This turned out so GREAT. I love it. Oh whatever. You are far from lazy. I am in LOVE. GOOD JOB! Could you possibly share what changes you’d make if you were making this for a twin bed? I found a herringbone quilt pattern for a twin bed that I loved but quilts are a lot of work and honestly not as more as a duvet. I found this and it’s exactly what I was looking for just a bit bigger! Thanks so much, it’s so beautiful!